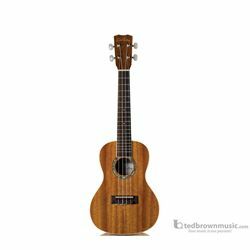 Cordoba’s best-selling 15CM offers the perfect point of entry for those looking to pick up the ukulele. This handmade concert ukulele features mahogany top, back, and sides, giving this small bodied ukulele a full, rich sound. Appointments like the 15CM’s abalone-style rosette and ivoroid body and fingerboard binding set this ukulele apart from other models in its price range. Additional features include a sleek satin finish, silver tuners with pearl buttons, and premium Aquila strings. Beginners and professionals alike will appreciate the 15CM’s good looks and easy playability. The 15CM is also available in soprano (15SM) and tenor (15TM) sizes, and also comes in an edge burst finish with pickup (15CM-E EB).